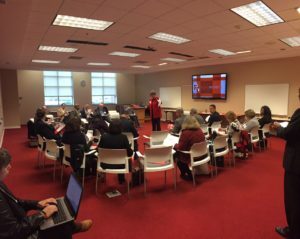 Candidates for NC State’s Educational Leadership Academy must apply to the NC State Graduate School. They also must complete additional application materials specific to the NELA program. After reviewing application materials, candidates are invited to attend Candidate Assessment Day, which includes a multifaceted evaluation process. Please view the video below to learn about our Candidate Assessment Day for NELA’s Cohort V.
Each Fellow has an electronic portfolio that provides documentation of each of these facets. Additionally, the portfolio contains evidences or artifacts for each standard. NELA conducts Formative Assessment Days with Fellows. Fellows participate in scenarios they may face as a school administrator. They are evaluated by NCSU faculty and the NELA project team and are given feedback. Fellows reflect on Formative Assessment Day and submit reflection videos. View the agenda from Cohort III’s Formative Assessment Day and a sample Cohort IV Fellow reflection video below. Later in the program, Fellows participate in a specific type of Formative Assessment Day, Mock Interviews. This Mock Interview is set up to be what Fellows may encounter when they apply and interview for leadership positions after graduating from the program. After the Mock Interview, they get specific feedback from interviewees on their interview skills and any materials they brought to the Mock Interview, including their resumes. Each fellow creates a digital portfolio with information about assessments and self-assessments.